We have new auctions on ebay - Oge Bulls and Yhetees. And expect some more new (click here) :) auctions soon! ... - unit commission. Finally it is finished (!!!) and ready to be showed. Check "unit" section in our gallery - We are sure that it is worth attention! ...this time check "large models" gallery! ... in our gallery. In particular we are persuading you to visit single miniature section! We have added new pictures to our gallery. The most new pictures appeared in "units" gallery section. 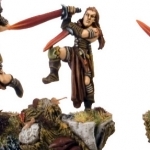 They are wood elves glade guards painted in autumn color scheme, dark elves crossbowman and harpies. We have very interesting proposition on our ebay auctions - Ogre Kingdoms rhinox rider. Miniature was converted and painted by Antar. Pictures of this miniature You can also find in "large models" gallery section.